COMPANY PROFILE IDFC Ltd is a holding company which is mainly engaged in investing activities. It is also involved in banking business, asset management, investment banking & institutional broking. IDFC Ltd is an Indian Non-Banking Finance company (NBFC). Its businesses are split into three parts Commercial and Wholesale Banking, Bharat Banking and Consumer Banking. Its Commercial Banking business comprises the Middle Market Group and the Small and Medium Enterprises Group. IDFC Bank’s Wholesale Banking business caters to the needs of large corporate customers. The goal of Bharat Banking is to deliver banking anywhere, anytime in a simple, no-nonsense way in rural and semi-urban locations, through intensive use of technology. Consumer Banking includes Personal Banking and Business Banking to cater to the needs of individuals and entrepreneurs and small businesses. The company operates only in the domestic market. 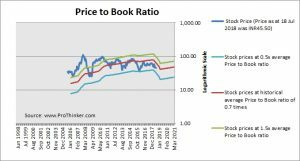 At the price of INR45.50 as at 18 Jul 2018, Idfc Ltd is trading at a Price to Book Ratio of 0.5 times current book value. 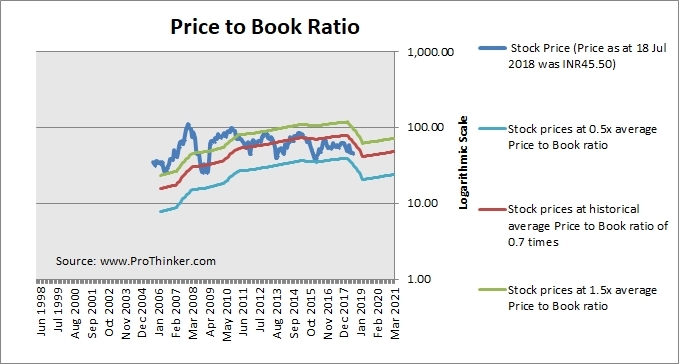 This is a 31% discount to its historical average Price to Book Ratio of 0.7 times.